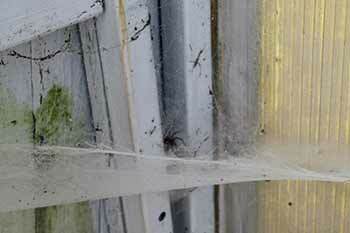 There is a tremendous number of spiders making a living in my yard. Here are a few. I really like spiders and will protect them whenever I can. There are quite a lot in my garden in the summer and they do a good job hunting insect eggs and catching whatever is trying to eat my vegetables. 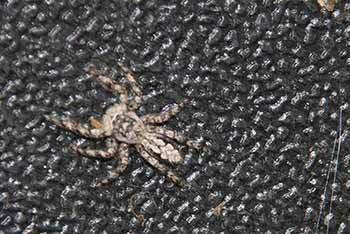 Wikipedia has a nice article about spiders. The above photos are a before and after set. 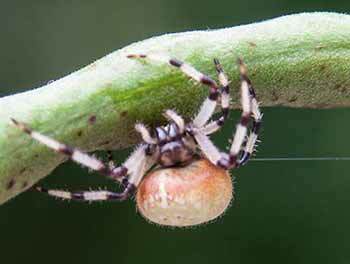 The tiny orb weaver spiders have just come out of their silk cocoon in the spring. This is the end of May. They dispersed after a couple of days. In the morning they were all huddled together but as soon as the sun warmed them up they spread out in a much larger area. 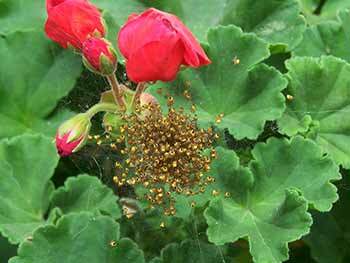 The larger spider (its body is about 3/4 of an inch) is from this batch of tiny babies. She is exceptionally large because she went and claimed a spot beside the composter and got a steady supply of flies through the summer. The photo was taken mid September. 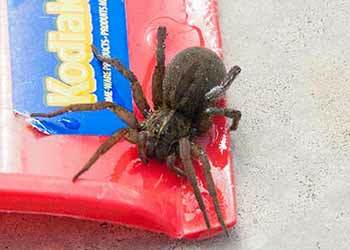 I have tremendous large wolf spiders around the pool. I often fish them out of the water. They can go in and sort of walk underwater. 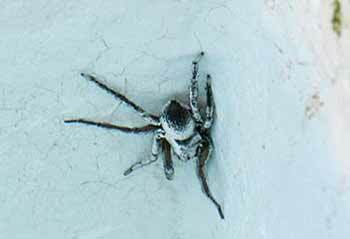 This is the same spider. When she goes underwater she looks very silvery because of the air stuck in the hairs that line her body. This spider is about an inch long plus the legs. I've never seen them build webs. They hunt actively and catch insects by sneaking up on them and running and jumping. 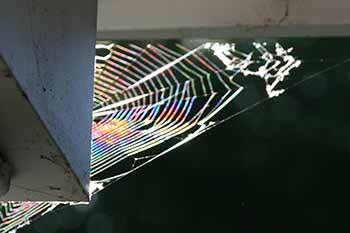 Lovely irridescent web off the front porch. Little spider in the flowers has caught a honey bee and wrapped it in silk. A good meal almost as large as she is. 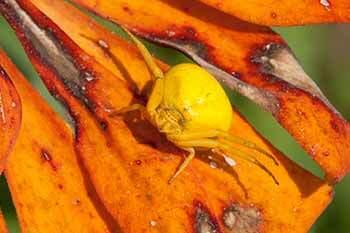 I think she is a yellow garden spider. 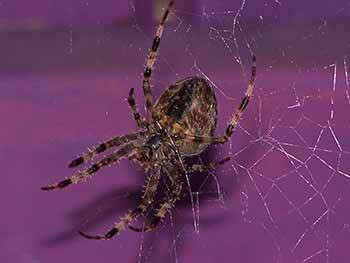 Some of the spiders make almost a cloth of silk rather than the spiderweb we are most used to. 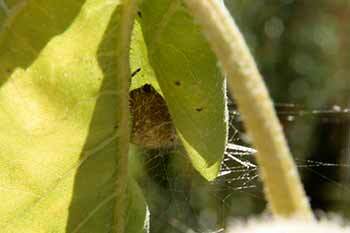 The second spider is making a hiding spot from leaves rolled down and stuck together with silk. This one lived in my garden and ate insects that attacked the vegetables. Many spiders do this. 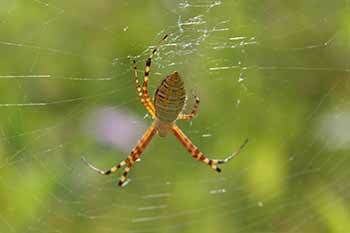 They don't make webs but rather hide and go hunting venturing from their silk house. 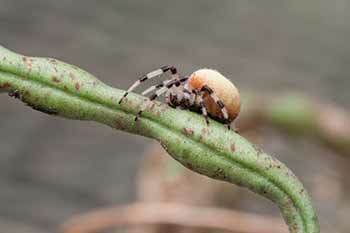 Fabulous big pinky coloured spider with stripey legs. 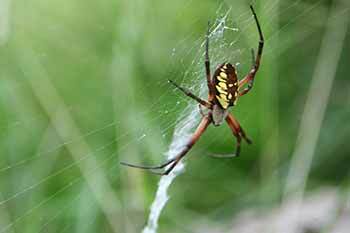 Spiders spin out a silk thread when they move around. It's quite easy to see in the first photo. 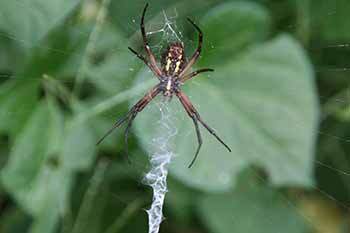 There are a great number of different varieties of spiders and it is quite complex to identify them exactly. 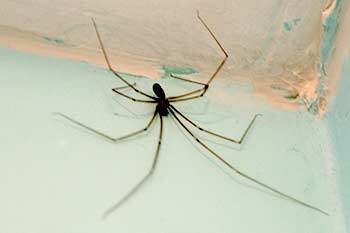 I encourage them as much as I can, like this daddy long legs that lives a protected life in my bathroom, but I'm not that compelled to identify them the same way I like to know the birds. 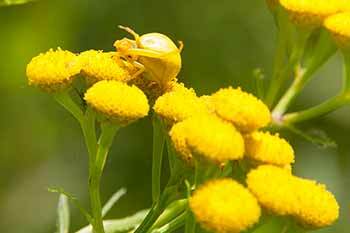 Fabulous yellow spiders, on tanzy at left and zinnias on the right. 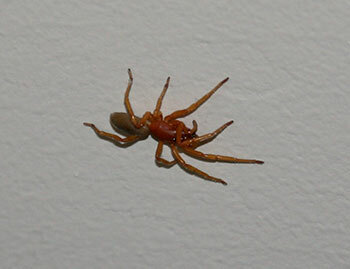 I was sitting at my computer and this orangy-red spider came down the wall. For some reason I found her spooky. I usually like them. 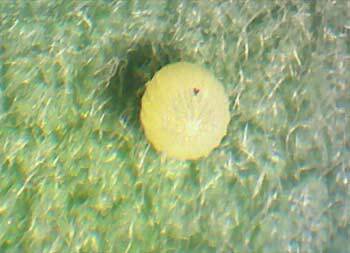 The photo is of a monarch butterfly laying an egg and of an enlargement of the egg she laid. 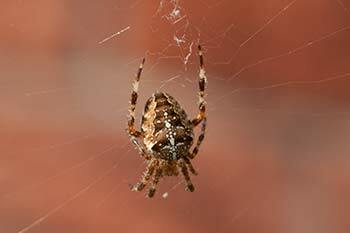 Some of the many insects that patrol the garden are spiders. Finding an egg like this is a score. 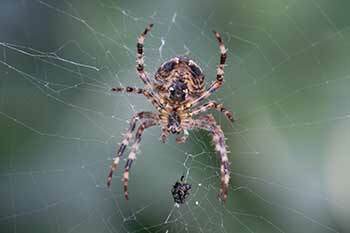 This is one of the ways spiders help keep the garden free of caterpillars and other insects. In order to collect monarch eggs to raise and release the butterflies, I had to be very quick to get to the eggs before the spiders, wasps and ants, among others, got to it. 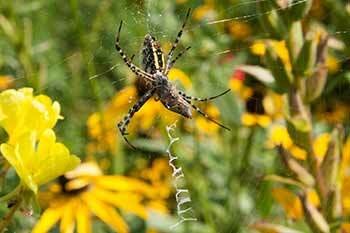 Almost all spiders have venom and they use it to help paralyze and kill their prey. Few are dangerous to humans in my end of the world. The larger ones can bite and hurt quite a lot though. We have black widow spiders. I've seen one in my life so they are not very easy to find and they are quite rare. They can be dangerous. This information is for general knowledge. 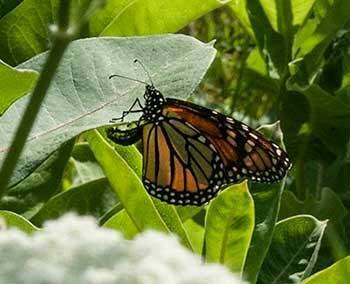 Some people are sensitive to milkweed sap and the plants are poisonous to humans and pets in various degrees. BE CAREFUL.